Long before Dark Souls told us to 'Prepare to Die', the designers at Sierra Online were proving that you don't need giant castles full of zombies to bring a game to an unceremonious halt. You just need a road. If you saw a road in a Sierra game, you knew it was a trap. Step onto it as Leisure Suit Larry and a car would drive along just in time to splat you. Do the same in Laura Bow without looking both ways, and again it was hero pancake time. And that's just two. It wasn't just the deaths though, but the fun the developers had with them. You'd rarely get something as mundane as 'You Died'. Instead, you got to witness awesome one-time animations made with deep sadistic glee, as your character gets flattened, stabbed, torn apart, or otherwise stars in a little presentation. 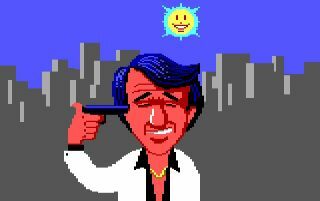 Leisure Suit Larry doesn't simply die, but gets taken underground to the Sierra factory, where heroes are made, and you watch your next character be assembled. Space Quest responding to an acid-based fatality by having the designers pop on screen and narrate your death, complete with action replay and a chalkboard, marking down the exact moment when you screwed up. (Spoiler—it involves trying to pick up acid, like a fool).